A JSF component that allows quick realization of a comment functionality with many features. You can reply to comments (and reply those, and so on). Other users are notified on new comments, replies and when other users type. Here you can download the latest jar. You can grab the Sources from the CommentBox Project Site at Github. I recomend to take a look at the demo at first. Just deploy the demo project in any AS with eclipse or your IDE of choice, and try out some features! After you played around with the demo you can start to use it immediatly or you can take a look at the extended demo. In the extended demo a real database is used via JPA. Because of that you need to create a datasource (commentboxDS) in the configs of your AS or rename the used datasource to one of yours (in persistence.xml). Then deploy the demo project in any AS with eclipse or your IDE of choice. Why should i use it, i could use some external chat service? You keep your data where it belongs, on your server ! Also you can (and are allowed to) make modifications to adapt to your special needs. You can connect this component to your own user-system and your users don’t need to have an account on your site and an additional account for the external system. This project is open source and free, it is available under the Apache v2 License. Although you said that “THIS PROJECT IS NOT MAINTAINED ANYMORE” but I still like this component very much. Could the show me the way to use it? You can try to include the component via the composite components URI (see here and here). Somehow the component could not be found, did you add the namespace? Take a look at the example source code. I’m working on a web Maven project with primefaces jsf 2.0 and primefaces 3.5. like table i have comment and article. 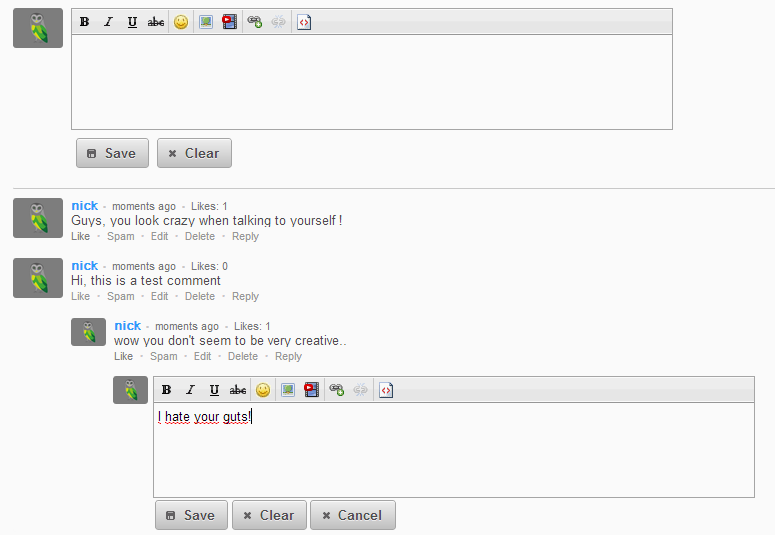 I want to integrate commentBox up in my project to manage my comments like demo. How? what sources that i must token? and what are the steps? Just include the jar (link) in your web project (in most cases this means putting it into your lib folder), then you can use commentBox. I suggest you to take a look at the demo (link). 2-I took the index page demosource. but I have this error. Caused by: java.util.MissingResourceException: Can not find bundle for base name info.whitebyte.component.commentbox.messages local en_US. You have an idea and I think it is an IDE problem knowing that I work in NETBEANS.. Caused by: java.util.MissingResourceException: Can not find bundle for base name info.whitebyte.component.commentbox.messages local fr_FR. Please report this Bug to the Issues on Github and provide additional details (Application Server, JSF Implementation, JSF Implementation Version, Primefaces Version,…). If you can’t use Github please post more Details here on the Blog. Thanks!